Patrick Carman is the bestselling author of the Land of Elyon series, as well as the Elliot’s Park series, the Skeleton Creek series, and the Atherton series. He got his start as a storyteller weaving bedtime tales for his two daughters. He lives in Walla Walla, Washington, with his family. 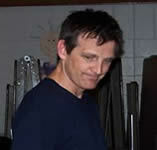 Read or listen to the first chapters of Patrick Carman’s books at his website. The Land of Elyon — (2003-2008) Ages 9-12. Publisher: Inquisitive twelve-year-old Alexa Daley is spending another summer in the walled town of Bridewell. This year, she is set on solving the mystery of what lies beyond the walls. Legend says the walls were built to keep out an unnamed evil that lurks in the forests and The Dark Hills. But what exactly is it that the townspeople are so afraid of? As Alexa begins to unravel the truth, pushing beyond the protective barrier she’s lived behind all her life, she discovers a strange and ancient enchantment — and exposes a danger that could destroy everything she holds dear. 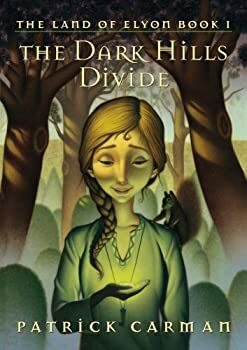 Patrick Carman's The Dark Hills Divide has a good if not all that original premise at its core — a kingdom of four cities completely walled in and a 12-yr-old heroine who longs to see what's beyond the walls. The walls were built a generation ago by Thomas Warvold, a well-traveled adventurer who came up with the idea to overcome people's fears of expansion into unknown and allegedly dangerous lands by building walled roads and towns using temporarily freed convicts as laborers. Decades later, Warvold's death sets into motion a slew of activity as the towns are threatened by those inside and out (internal kingdom strife, a possible high-level traitor, the supposedly re-imprisoned convicts) and previous assumptions are questioned (the dangers of the outside land, the effectiveness of the walls versus their societal cost, etc.). Atherton — (2007-2008) Ages 9-12. Publisher: From the creator of the Land of Elyon comes a riveting adventure set in an extraordinary satellite world — created as a refuge from a dying Earth — that begins to collapse and forever change the lives of its inhabitants. Edgar, a gifted climber, is a lonely boy scaling the perilous cliffs that separate the three realms of Atherton: a humble fig grove; a mysterious highland world of untold beauty and sinister secrets; and a vast wasteland where he must confront an unspeakable danger that could destroy the people of Atherton. When Edgar discovers a book which contains the history of Atherton’s origins and ultimate apocalypse, his world — quite literally — begins to turn inside out. 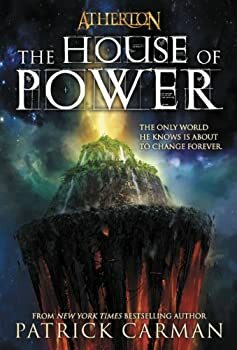 The House of Power is the first installment in Patrick Carman's ATHERTON trilogy. As such, it is expected that there be some ‘setting up’ for the next book. These expectations are surpassed, as there is little else but setting up for most of this book. Halfway through The House of Power all that was still happening was the suggestion of more problems, and it seemed that I would have to read the rest of the trilogy to get any answers at all. The House of Power seemed to be purely background knowledge with holes in it. There are some exciting plot developments at the end, but those are left as a cliffhanger. 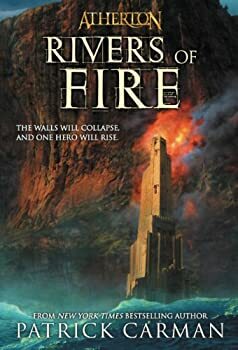 Rivers of Fire is by far the strongest book in the ATHERTON trilogy. From beginning to end, the plot moves quickly, the characters develop and play to their own strengths, mysteries are resolved, bravery is tested, lives are lost, radical changes begin anew, foes are slain. And all while Atherton shows its true self. He was so proud of him and all that he’d done, proud enough to never call him his maker again. 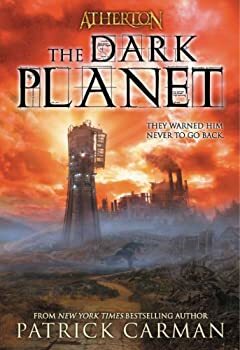 The Dark Planet is the conclusion to Patrick Carman's Atherton trilogy about a young boy, Edgar, and his adventures while finding out who his father really was. Along the way he makes numerous friends on Atherton, and the Dark Planet itself. He knows he was made for a purpose, he knows he doesn’t have real parents like everyone else, he knows his maker went to a great deal of trouble to save a handful of people on a made world. What he doesn’t know is that his adventures aren’t over yet. 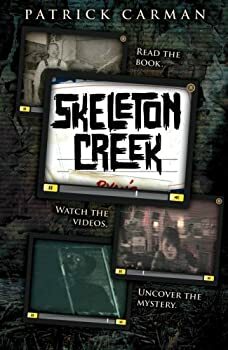 Skeleton Creek — (2009-2014) Ages 9-12. Publisher: Strange things are happening in Skeleton Creek… and Ryan and Sarah are trying to get to the heart of it. But after an eerie accident leaves Ryan housebound and forbidden to see Sarah, their investigation takes two tracks: Ryan records everything in his journal, while Sarah uses her videocam to search things out… and then email the clips for Ryan to see. In a new, groundbreaking format, the story is broken into two parts — Ryan’s text in the book, and Sarah’s videos on a special website, with links and passwords given throughout the book. In the Skeleton Creek duology, best friends Ryan McCray and Sarah Fincher team up to investigate the mysterious goings-on at an old mining dredge in their town. The story is told in Ryan’s journal, in which he records his thoughts and his correspondence with Sarah; and in Sarah’s films, creepy Blair Witch-style videos that are accessible on the Internet using passwords given in the text. Before I go any further, I should say that Skeleton Creek is not fantasy and is better categorized as mystery. Dark Eden — (2011-2012) Young adult. Publisher: Fifteen-year-old Will Besting is sent by his doctor to Fort Eden, an institution meant to help patients suffering from crippling phobias. Once there, Will and six other teenagers take turns in mysterious fear chambers and confront their worst nightmares — with the help of the group facilitator, Rainsford, an enigmatic guide. When the patients emerge from the chamber, they feel emboldened by the previous night’s experiences. But each person soon discovers strange, unexplained aches and pains…. What is really happening to the seven teens trapped in this dark Eden? Patrick Carman’s Dark Eden is a provocative exploration of fear, betrayal, memory, and — ultimately — immortality. Pulse — (2013-2015) Publisher: Best-selling author Carman launches a new series in a dystopian civilization that has its roots in today’s United States. It’s 2051, and global warming has wreaked havoc around the world. Most of America’s remaining population has moved into one of the two remaining States, where life is stringently controlled and people are kept amused by whatever latest entertainment is available on their ever-present Tablets. Outside the States, life is freer, but even there, kids like Faith Daniels still have to go to school, despite shrinking student populations. On her own, she clings to her friendship with Liz while wondering what it would be like to have a boyfriend like Wade Quinn. She soon finds out that both Wade and his sister Clara are dangerous. When Liz and her family move into the Western State, Faith is even more alone, except for Hawk, a genius hacker, and Dylan, who can not only move things with his mind, but ward off almost all threats to his body. Faith has this extra “pulse” as well… if only Dylan can train her to use it in time. The third-person narration shifts from one character’s perspective to another in short, colloquial chapters, keeping the pace swift from the beginning. Carman’s grounding of his dystopia in this recognizable near-future makes it highly believable. Thirteen Days to Midnight — (2010) Publisher: You are indestructible. Three whispered words transfer an astonishing power to Jacob Fielding that changes everything. At first, Jacob is hesitant to use the power, unsure of its implications. But there’s something addictive about testing the limits of fear. Then Ophelia James, the beautiful and daring new girl in town, suggests that they use the power to do good, to save others. But with every heroic act, the power grows into the specter of a curse. How to decide who lives and who dies? In this nail-biting novel of mystery and dark intrigue, Jacob must walk the razor thin line between right and wrong, good and evil, and life and death. And time is running out. Because the Grim Reaper doesn’t disappear. . . . He catches up. CLICK HERE FOR MORE BY PATRICK CARMAN.